The playoff schedule is below. The "seed" is the play the team finishes. In Level 1 and 3, the 1st place team, or Seed 1, goes straight to the championship game. Championship games are scheduled for 6/2/2019. The hockey clinic will resume on 2/14 and will run from 6:30-7:30pm. THE HOCKEY CLINIC WILL RESUME ON 2/14. We have an option to have the clinic prior to that from 7:30-8:30pm. We are currently evaluating whether or not that is a good option. The season will start on February 23rd. The league fee increases on February 4th so register before that date to save money. Use the link below to register! In the event of inclement weather, the league will provide updates on our league phone number, Facebook, and this website. Because we might not have access to update the website, it would be good to check 2 sources if you are concerned. Our mobile app allows for you to track your team from your phone! You can use the link below or search for it in your app store. 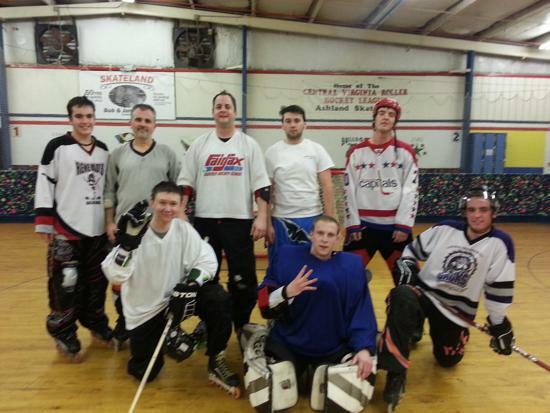 Enter "Richmond Roller Hockey League"
If you have issues, email RVARHL@GMAIL.COM and we will help. We are excited to get fall season going. We have some changes and news to share with the league members. 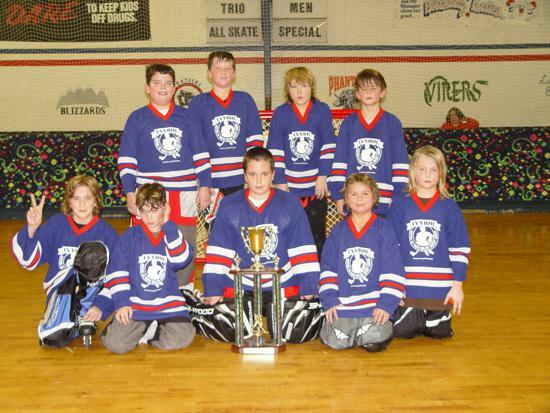 The hockey league has been playing out of Ashland Skateland since 1992. Last week, we were informed that the rink is no longer interested in having the hockey league play in the facility. They have decided to use the timeslot for other activities. It's a business decision that we can understand. In recent years, we have lost some of our slots (Saturday games, Thursday night clinic) so we have anticipated that this day might be coming. We would like to thank Skateland for the use of the rink for 25+ years. Thousands of youth have started their hockey journey at that rink. It has been a special place for so many families. 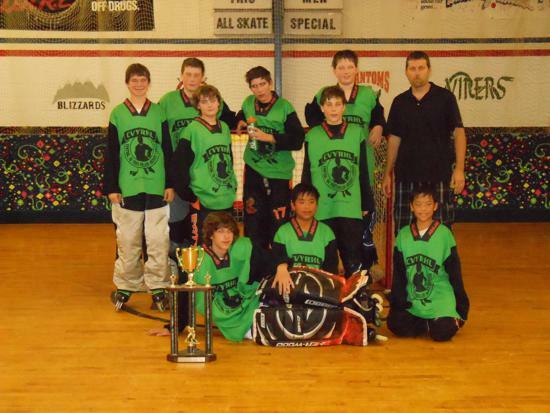 In the 1990's, roller hockey was played with a ball. 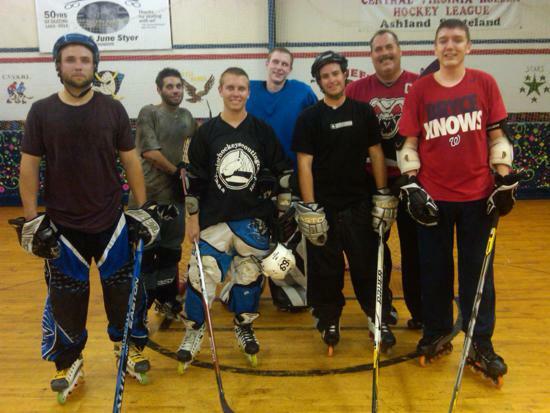 The RRHL (formally CVYRHL) is one of the last leagues to play ball hockey on skates. While we hate to leave what has been our hockey home for 25+ years, we are EXCITED that The Ozone has welcomed us with open arms to relocate our league there. The Ozone is built for hockey and this is a natural transition for our league. With more time slots available at The Ozone, we can focus on growing our league again! Now that we have formalized the details for our new home, it's time to REGISTER and PLAY HOCKEY! Help spread the word! If you recruit a new family, you will receive a $20 discount for each and every player that registers! We are still looking at Sunday games for the league. However, now is the time to look at all of our options and what is best for our league members. If you have a preference or you have days that your son or daughter can't play, please send us an email. If you have questions, please email us at rvarhl@gmail.com. 18u Tour Richmond Rattlers win Gold! The RRHL 18u Tour Richmond Rattlers took Gold in the April 2017 regional qualifier for Torhs 2Hot4Ice in Raleigh, North Carolina! During round robin play, the Rattlers best game was played at 12:45am Saturday night (well, Sunday morning) against a tough NC team. On Sunday, the Rattlers faced that same team again and had another solid performance winning the final game 3-1 (empty net goal at the end). In regulation, the Rattlers gave up a total of 6 goals. 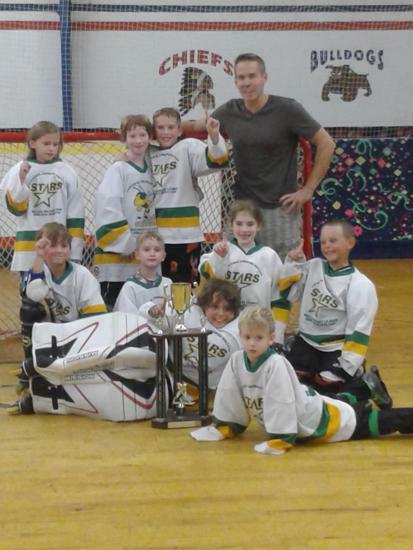 The teams thrives on great defensive play from the entire team (defense, offense, and goalie). 2018 Fall Season - Divisions have changed! The RRHL has decided to make adjustments to how the divisions are organized. There are many factors that were considered and significant thought was put into it. The number of high school graduates, current membership base, and new facility were big factors in the league deciding to restructure. Our youth divisions are still listed as Level 1, 2, and 3. Players are assigned to a Level based on both age and skill level. We have eliminated the "A" and "B" lines and have instead tried to have each Level better represent the skill level of the players. This will allow for line changes that are more realistic (shorter shifts), longer periods, and more time playing hockey. This is a work in progress. We welcome feedback as we move forward! Rinks around Virginia have pulled together to form a league that allows for "all star" type teams from each rink to play against each other. The divisions include Elementary School, Middle School, and High School. It's not a huge commitment of time. We will practice some and the games are generally once a month. The cost is minimal. The registration process includes a question around interest in RSL. If you respond "yes", we will evaluate your son/daughter for a spot on the team. We don't plan to hold formal tryouts for the teams. Our preference at this time is to evaluate the players without putting them through the stress of a formal tryout. Responding "yes" is not an agreement to play. We will share more information with you and you can make a decision at a later time on whether you are interested. Games run November through February. Usually 5 game dates over the course of that time period. The hockey clinic will resume in the fall. For the summer, we have transitioned to pickup hockey on Monday nights! This is the most important piece of equipment. There is a big difference between skates (wheels) made for the outdoors and indoors. Wheels used outside are typically hard and sometimes even plastic. Wheels made for the inside are softer and are made of rubber. If you try to use outdoor wheels, especially plastic ones, it's extremely hard. If you use your indoor wheels outside, you will ruin them in a short period of time. Skates also can't have any bolts or medal sticking out. These are often found on outdoor skates or old skates. The bolts will cause damage to the playing surface. Skates MUST HAVE a full set of wheels. A player can't start a game with an empty slot for a wheel. The risk of injury to another player and risk to rink damage increases. Get updates on league events and more! Click link above! 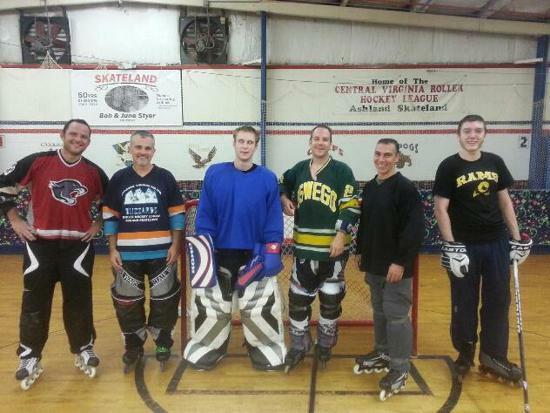 The RRHL is located in Ashland, Virginia and plays at Skateland. 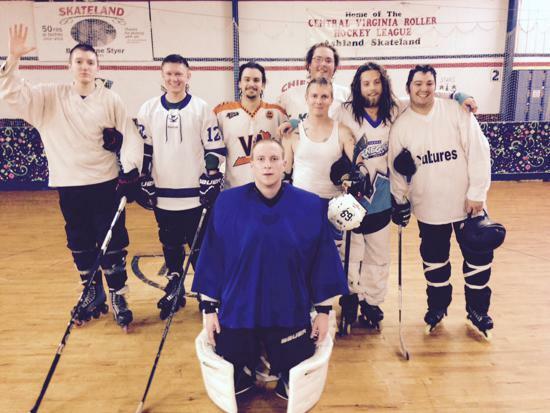 Under the name CVYRHL, the league started in 1992. In 2016, the league name changed RRHL as the organization earned it's non-profit status. We are a big family that loves hockey and we have a ball when we play! 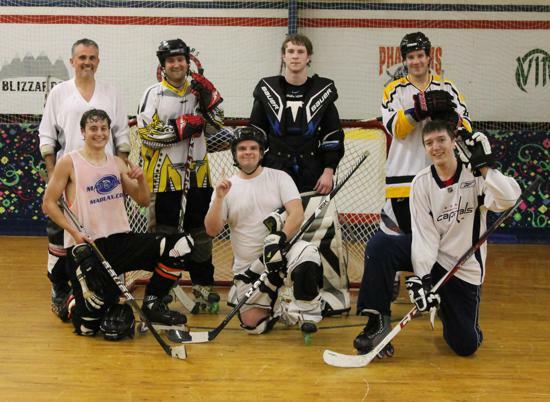 ©2019 Richmond Roller Hockey League / SportsEngine. All Rights Reserved.